Kumbh Mela is the largest peaceful gathering of pilgrims who come together every three years in Haridwar, Prayagraj, Ujjain, and Nasik. The Kumbh returns to each of these cities after every 12 years to mark the celebration of Hindu heritage. Kumbh Mela 2019 commenced today in Prayagraj (formerly known as Allahabad) and will go on till March 4. You will not be able understand the passion of the devotees and chaos of the Kumbh if you are not experiencing it with your eyes at Prayagraj. Prayagraj Kumbh Mela is a celebration of India’s age-old culture and traditions. It is the largest peaceful gathering of pilgrims who come together every three years in Haridwar, Prayagraj, Ujjain, and Nasik. The Kumbh Mela returns to each of these cities after every 12 years to mark the celebration of Hindu heritage. The Yogi Adityanath led Uttar Pradesh government has its task cut out to safely manage approximately 12 crore devotes who will descend down at Prayagraj for the Prayagraj Kumbh Mela. Several thousand will visit each day for the Kumbh Mela till March 4. Lets find out more about the life altering experience of being at the Kumbh Mela. The first royal bath or Kumbh Mela Snan (Shahi Snan) of the Kumbh Mela 2019 took place today, on the auspicious day of Makar Sankranti. All the prominent religious groups take a dip at the Triveni Sangam at Prayagraj today. The second Kumbh Snan will take place on January 21 and is called Paush Poornima. 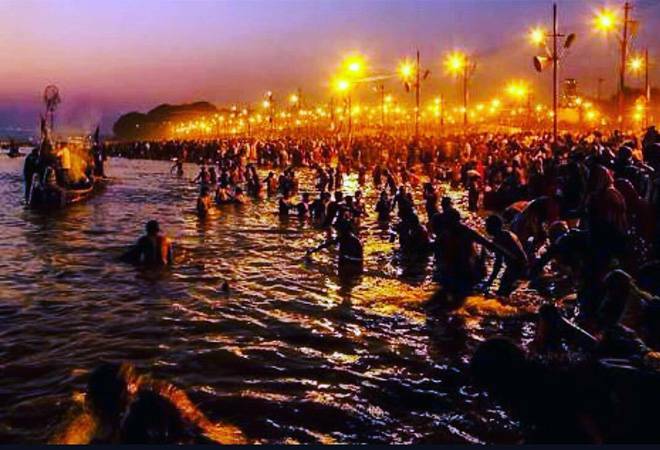 The last Kumbh Mela Snan will be observed on the day of the festival of Maha Shivratri on March 4, 2019. Kumbh Mela derives its name from the immortal pot of nectar over which Asuras and Devtas fought over. Lord Brahama advised Devas to churn out the nectar with the help of Asuras. When Asuras found out about the Devas plan to not share the nectar with them, they chased them for 12 days during which the nectar fell at four locations: Haridwar (River Ganga), Prayag (Triveni Sangam of Yamuna, Ganga & Saraswati), Ujjain (River Kshipra) and Nasik (River Godawari). The Kumbh Mela returns to each of these locations after a span of 12 years. The Allahabad Kumbh Mela is the ‘world’s largest congregation of religious pilgrims’. Kumbh Mela is held on dates when the water of sacred rivers turn into nectar. The exact dates are calculated as per the combination of zodiac positions of Jupiter, the Sun and the Moon. Hindus believe that people who bathe in the river during the auspicious dates are blessed by the Gods themselves and all their sins would be washed away. Peshwai is an important part of Kumbh Mela. Peshwai is marked by a grand procession to indicate the beginning of the Kumbh Mela by welcoming people from all around the world. Special routes are demarcated for these processions. Praygraj is well connected by road, train and air. The airport is 12 km away from city centre at Bamrauli. The city has four major railway stations namely Allahabad Junction, Prayag Station, City Station at Rambagh and Daraganj Station. Prayagraj is easily accessible via roads as well. During the Allahabad Kumbh Mela, inland waterways will be used for transporting pilgrims and tourists between Varanasi and Allahabad, a distance of 60 km. The government has set up four floating terminals, one each at Kila Ghat, Saraswati Ghat, Naini Bridge and Sujawan Ghat. Additionally, two vessels – CL Kasturba and SL Kamla – and small boats will be deployed for pilgrim movement. During the Allahabad Kumbh Mela, a laser light and sound show would also be held at the Prayagraj Fort Wall. Special trains are being run by the Indian Railways to Prayagraj during the Allahabad Kumbh Mela. Similarly, several new flights will be operational from January 13 to March 30.